Spring is in the air and the weather is starting to become decent to start showcasing my wares. 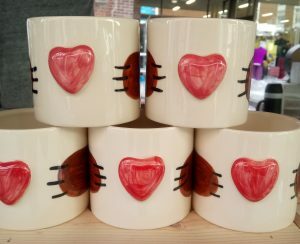 I have been busy sorting out my stock in the studio and making a few new pieces and planning ideas through the year that I will be bringing out. 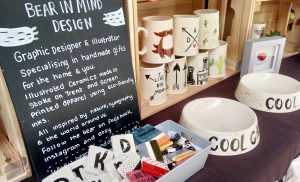 I decided to venture out for my first show of the new year and take part in the Makers Market in Uttoxeter, Staffordshire perfect for Mother’s Day gift purchases. I found the day to be pleasant and the people were supportive throughout the day along with the artisans. I managed to showcase some new wares and it is always good to get peoples feedback. 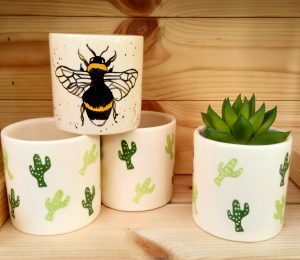 As I produce a range of items from illustrated ceramics to printed apparel, I am going back to the drawing board on certain ranges and designs so that all my designs will begin to be available in both ranges. I will also this year be working on my website so you will be able to purchase items from here but in the meantime you can email me or visit my etsy shop. I look forward to getting out from behind the desk for the rest of the year and meeting more lovely customers.